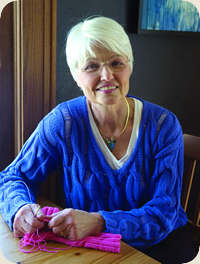 Chris retired from a career in marketing communications and advertising to pursue her artistic passion – knitting and textureplay – in her hometown, Madison, Wisconsin, and enjoy a little gardening with her husband, Charlie. Instead she is having a wonderful time teaching workshops coast to coast – and beyond – for TNNA, shops, guilds and conferences and has her own line of knitting patterns available through retail yarn shops. She has also designed knit garments for the American Girl clothing line and has been featured in Vogue Knitting, Knit Simple, Creative Knitting and Knit n’ Style. Taught by her grandmother to knit at age seven, Chris was encouraged in her knitting thereafter. When she was a teenager, her father offered to pay for her knitting yarns so she would follow through and complete her projects. He soon regretted making this offer but kept his (expensive) promise! Of her career life, Chris says, “I continued to knit off and on as I pursued my career in marketing and advertising including a short stint in bank marketing. I am definitely not a pin-stripe type, though. I have long arms so I resorted to knitting my own designer suits that were presentable in the stuffiest of boardrooms yet were comfortable and traveled well. I called them my St. John knits for the financially challenged.” Chris continues to design to fill a specific need in her wardrobe. "I became more daring with age (purple is my neutral)." Others took notice and commissioned her knitwear. When she left the corporate world a few years ago, she started teaching classes locally, first, and now nationally and internationally. In her teaching role, Chris’ reward is when the "light bulb" goes off and knitters learn to discover and trust their own creativity. Among others, her classes include finishing techniques, unusual ways to combine colors and gauges, and special knitting techniques, such as the dropped stitch. In her workshops, she encourages knitters to “color outside the lines” - where it’s more fun! Chris firmly believes that knitting is not construction. Knitters should explore and make mistakes, feel free to change their minds and most of all, enjoy what they are doing. Chris’ wearable classic designs are notable for their ease, clever constructions, and fresh, surprising looks. Her Crayon Box Jacket and inventive Ladder Shawl designs are two of the most notable. Also a Master Gardener, Chris finds inspiration in nature’s colors and combinations, and her knitting designs reflect her pleasure combining fibers, textures, gauges, colors, in ways that create fun, wearable knits. Her easily identified patterns on bright pink paper are available at fine yarn stores throughout the US and in several foreign countries as well. Her website, ChrisBylsmaDesigns.com, showcases all of her designs and provides a list of sources.